“We have reached the extreme limit of microscopy; you can not see anything smaller than an atom using visible light,” Professor Dave Kielpinski of Griffith University’s Centre for Quantum Dynamics in Brisbane, Australia. 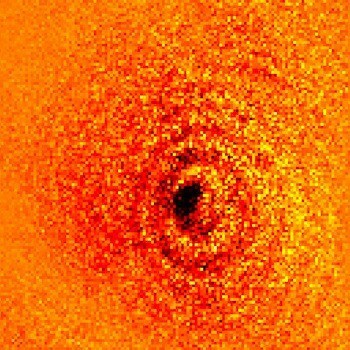 “We wanted to investigate how few atoms are required to cast a shadow and we proved it takes just one,” Professor Kielpinski said. Published this week in Nature Communications, “Absorption imaging of a single atom “is the result of work over the last 5 years by the Kielpinski/Streed research team. No other facility in the world has the capability for such extreme optical imaging. Professor Kielpinski and his colleagues trapped single atomic ions of the element ytterbium and exposed them to a specific frequency of light. Under this light the atom’s shadow was cast onto a detector, and a digital camera was then able tocapture the image. “By using the ultra hi-res microscope we were able to concentrate the image down to a smaller area than has been achieved before, creating a darker image which is easier to see”, Professor Kielpinski said. “If we change the frequency of the light we shine on the atom by just one part in abillion, the image can no longer be seen,” Professor Kielpinski said. Research team member, Dr Erik Streed, said the implications of these findings are far reaching. “Such experiments help confirm our understanding of atomic physics and may be useful for quantum computing,” Dr Streed said. There are also potential follow-on benefits for biomicroscopy. “This is important if you want to look at very small and fragile biological samples such as DNA strands where exposure to too much UV light or x-rays will harm the material. And this may get biologists thinking about things in a different way.